Things for my daughters to discover when they're older. 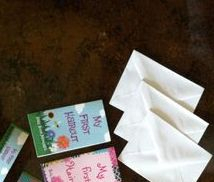 Crafty, heartfelt and memorable, it's all for them; and You! Miss B saw a magician at school, and fell in love with it. She got a bunch of magic kits and hats etc. for her birthday, and it inspired her to be a magician for Halloween. I convinced Miss M that a magicians bunny was the perfect fit to match her sister. luckily I still had the white fur coat from the Ausi costume last yea (See below). I hand made the bow ties, wand and bunny ears. I customized the hat, the bunny nose and the magicians gloves. Notice Miss M's carrot painted on her finger? so fun. Leah Laurie Photography had a Halloween mini photo op, and took these amazing photos. The kids had a great night! I love Halloween. Brianna wanted to be a witch. I suggested a cat to go with it to Miss M and she loved the idea. Then Miss B decided that she wanted to be a cat as well. If I'm making two cat costumes, I'm going to need some inspiration. Our Cats, Herb (Grey) & Ausi (White) have been in our little family a lot longer than the kids. I'm glad we did this tribute to the kitties, because it was the last Halloween that Ausi would spend with us. She passed away of old age the following August. The ears and tails are hand made, and I covered their gum boots with fur. I also made them baskets covered in fur. I attached the whiskers with eye lash glue. Miss B asked to be a ghost for Halloween in the summer, and refused to change her mind! I tried hard to convince her too, as a ghost costume isn't the easiest thing to pull off for a toddler. So I decided, what the heck. You can be a ghost. You and your sister can be matching scary ghosts. I found a picture on Pinterest for INSPIRATION and decided to get creative and I cut up two little table cloths (photo below) which my grandma had sewn for our wedding. They were for tall skinny tables, so I only had to cut head and arm holes, hem it, cinch it in, and add some quick sleeves. On Halloween Day, we got the girls all dressed up, and went to their dance studio and had photos done by the super talented, Jennifer Dodd. We had spent the day practicing the girls scary face, which was chin down & eyes up. I had a blast. The tulle veils didn't make it two minutes into trick or treating, but I didn't mind, and it was so easy to see them dressed all in white. I think Halloween is becoming one of my favorite holidays since becoming a mom. I cant wait to see what crafty choice my Dear Daughters want to dress up as next year! Miss B's 4th birthday. Their reaction was so sweet! Follow Kirstin Parkin's board Girls bedroom Reno on Pinterest. ~ Use a New needle for every project. A dull needle can ruin a project. ~ Clean the lint out of your machine regularly and keep it oiled. A Magician and a Bunny Costume. The Girls Shared Bedroom Reveal!! We agreed over Christmas that for the girls birthdays this year, we would give them a big girl bedroom makeover. Little Miss M turned two yesterday, and I only have a three year old for eleven more days and then Miss B will be four. I have been feeling nostalgic about their nursery that I designed four years ago. I thought I better take some pictures before we take it down next week, so that they can always find pictures of the first bedroom they shared that I made with love. We will have a bedroom reveal soon! I made two of these bird mobiles; one for over the crib and one for over the change table. This AMAZING black out shade is by Phantom Screens. I cannot recommend it enough. When pulled down, it completely darkens the room to pitch black. This has been a lifesaver when it comes to daytime naps and summertime bedtimes. From an old nutrition slider chart to a two child reward chart. We were having a hard time during dinner time with our two little girls, so I created this to reward the behaviour we like. Each girl can earn up to three points a nights, one for eating a good meal, one for eating veggies, and one for using good table manners. Once they reach ten, they get a special treat. It could be a special dessert, or a special activity. All that I know, is that it has helped! All I used was some modge podge and scrap book paper, as well as some washi tape and sticker letters. Upcycle WIN! I love to throw a party, and hand making the decorations is really the best part. My dear coworker had a beautiful baby girl in May of 2014. I surprised her by commissioning a mermaid outfit for her newborn photo shoot with Jennifer Dodd. It really doesn't take much to make a party successful, all you need is good food, and a comfortable atmosphere, but thoughtful details never go unnoticed. I chose clear balloons (which took 6 stores to find) to mimic underwater bubbles, and I painstakingly recreated the mermaid mom/baby cake toppers from a pin I found on Pinterest. I used modge podge, green glitter ribbon and scalloped craft scissors to create the mermaid tails, and used cutouts from the invitations to craft their tops and hair details. Simply dip your child's naked bum in a plate full of orange plate and stamp yourself the cutest little bumprint pumpkin you've ever seen. Embellish with the details once it is dry and make a note of the date on it. I save these and display them every year and remember how, once upon a time, her lil bum was really that tiny. Remember to have wipes handy! Miss B's Hair has always been epic. She arrived to this world with a head full of jet black hair. She even had hair on her ears and shoulders, but that went away in a few weeks. Over the span of almost three years, it grew out into a flowing main of blonde locks that always seemed to catch peoples attention. It got a lot of comments over the years. I told her that as a reward for successfully finishing potty training, she could get her first haircut. I think her daddy had a harder time with that one than any one else. 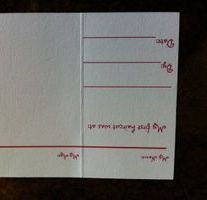 I've got a friend who makes these amazing First Haircut Keeper Cards and sells them on Etsy. They are awesome! I'm so glad to have a special card to put in her baby book with that lovely length of hair. She has three different styles to choose from. 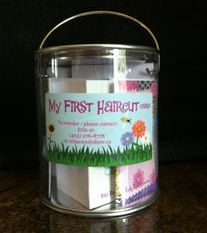 She even has kits for hairdressers who want to send home their newest clients home with a special keepsake. Her appointment at the salon was a success - she was so well behaved and brave. With a few snips of Heidi's scissors, she instantly grew up from a little todder into a big girl. Thanks to Erin at Aura Lounge on Etsy, and Heidi at Image 1 Salon for being apart of something that means so much to us. We asked our guests to sign the inside of this book for you to have as a special keepsake in your library. I mixed box cake mix with blue jello, as well as mixed the butter cream icing. So delicious! An ocean themed birthday for our little water loving baby seemed only fitting. From specially folded starfish napkins, and custom painted and bedazzled birthday girl outfit, I tried to think of every detail. When Miss B was born, I started a tradition. I decided that every year, I would create a Christmas Ornament for them to keep when they move out of our home. Three Christmas's later, I now have two littles to make these for. I'm incredibly sentimental, and so far, I have managed to craft ornaments that hold serious sentimental value. These clear plastic globes are from Michaels craft store. I filled them with old garland that we inherited from my daughters great-great grandma. The green stickers were saved from our wedding. Total cost was maybe three dollars, but they turned into priceless keepsakes. Never underestimate the power of knowing a bit about sewing. I bought a small piece of fabric that I loved and gave a thrift store throw pillow a makeover. No Pattern to follow, just a simple finger pleat pinned down. You can create some great original décor items that will wow people by spending some time behind a sewing machine. A few years ago, I never would have considered giving my daughter pretend makeup. I thought that little girls shouldn't think about makeup. They're too young and innocent to tell them they need makeup to look beautiful. Then my toddler became obsessed with my makeup. If I was putting some on, she HAD to be there doing it with me. I realized that she doesn't think of makeup any way other than that her mommy uses it. I decided (and convinced the hubby) that allowing her to play with make up would foster a healthy relationship with makeup and that I'd have a better time teaching her how to use it modestly when she's older if I taught her that it's okay now. It's not taboo. When she's old enough, she will use it. Why not let her play pretend and let her do what mommy does. Not a Biggie in my books. So I made her her own set of makeup, so my expensive stuff doesn't get wasted . She was SOOO excited to have her own mirror and brush set. I figure that if she's looking in the mirror saying "I'm Boootiful" than it's a good thing. *Now that Miss B is older (15 months) they play with this make up all the time together. It's really so sweet. Collect old make up containers. I found eye-shadow, blush and foundation compacts worked great. Give them a good thorough scrub after a soak in vinegar. I used a toothbrush, cotton swabs, baking soda, and a microfiber cloth. Dry Thoroughly. *be careful not to rub off the stickers when you wash them, you'll be left with a sticky mess where the sticker was. You can use baby oil or olive oil to get rid of the glue residue though. In a well ventilated space, use your old nail polish to fill the compartments with polish. Be careful not to use too much. Have nail polish remover on hand for spills. Get creative with mixing colours. Heads up- this is really stinky!!! After I was done, I put them all on a cutting board and moved them to the basement to dry (and continue stinking). Let it Dry for Weeks . I got pretty excited to give it to Miss B so I didn't let it dry long enough. Dry to the touch wasn't dry enough. This is what happens if you rush the drying process. Two weeks is probably sufficient. Get a pretty make up bag, some brushes and a toddler friendly mirror and let them play. Do each others make up and then look in the mirror and tell each other that you look beautiful. My kids love this pretend make up. and any reason to get them to say that they look beautiful is a good thing.